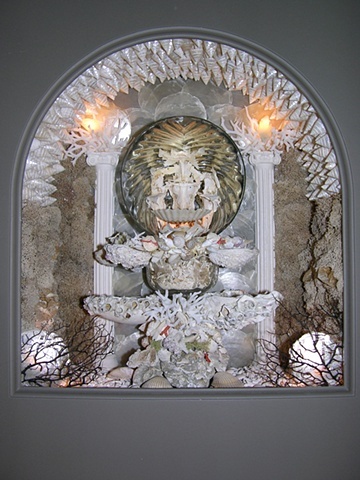 The "Grotto of Tethys" was created for Martha Glowacki's installation "Loca Miraculi/ Rooms of Wonder" at the Milwaukee Art Museum. "Loca Miraculi/ Rooms of Wonder" combines historic objects from the Chipstone Foundation's collection of furniture and ceramics with original artworks in "ways that delight our eyes, awaken our minds, and stimulate our emotions." "Loca Miraculi/Rooms of Wonder" will be on display at the Milwaukee Art Museum until 2012.